Bolt's career has been prolific and varied. She spent most of her 20s acting in New York and venues around the country, including five years in the company of the Cleveland Play House, the oldest resident theatre in the U.S. Bolt's career shifted after starting a family, and she took a "day job" as first Program Associate and then Theatre Program Director at the New York State Council on the Arts. She has since held the titles of Director of Theatre & Musical Theatre at the National Endowment for the Arts in Washington, D.C., Interim Executive Director of Theatre Communications Group in New York City; Program & Philanthropy Consultant; and currently Adjunct Associate Professor at Columbia University School of the Arts in New York City. The School of the Arts was lucky enough to chat with her recently about her time at KU, her multi-facted career, and her advice for students studying the creative and performing arts today. SOTA: What did you major in at KU? Bolt: I double majored in Theatre and French. SOTA: What was your first job out of college? SOTA: Since that summer in Chicago, highlight a few of the titles you've held so far in your career. Bolt: Let's see. In chronological order: company member, Cleveland Play House; Director, Theatre Program, New York State Council on the Arts; Director, Theatre and Musical Theatre, National Endowment for the Arts, Washington, D.C.; Interim Executive Director, Theatre Communications Group, New York City; and Adjunct Associate Professor, Columbia University School of the Arts, New York City. SOTA: That's a pretty incredible and wide-ranging list of jobs. Tell us a little more about how you moved from your first job after graduation to now. Bolt: My career has indeed encompassed several diverse - and unforeseen - chapters! After graduation and a summer studying and working in Chicago, I boarded a bus and headed to New York to work as an actor. 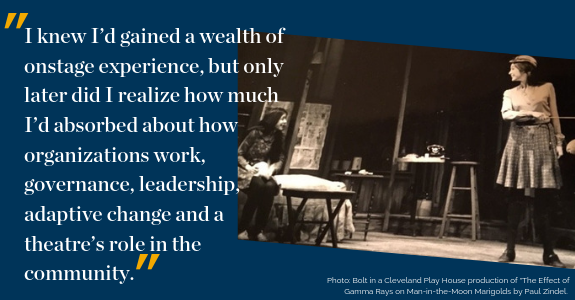 My 20s were spent acting on and off Broadway, on tours, in regional theatre and in stock, with five of those years spent in the company of the Cleveland Play House. While I was there, we rehearsed one show during the day, performed another in the evening, and took six shows to Chautauqua, NY each summer. During those year's the theatre's founder retired and three artistic directors followed him in quick succession. After returning to New York, and with a young daughter at home, I decided to take a “day job” at the New York State Council on the Arts. During those years, off-off-Broadway and the national regional theatre movement were in full flower. 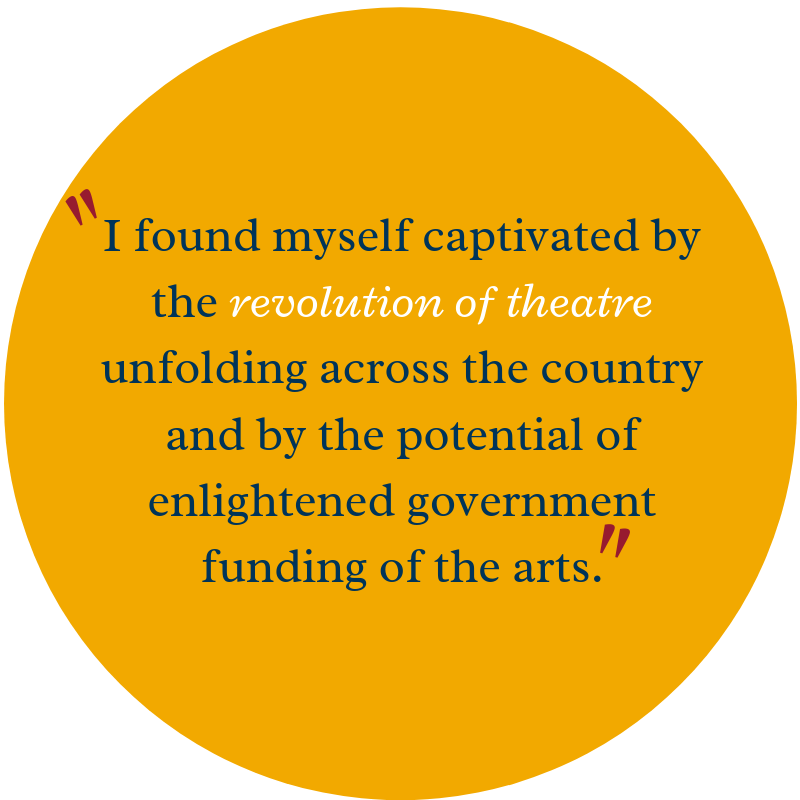 Though I’d initially viewed the job as a temporary interlude, I found myself captivated by the revolution of theatre unfolding across the country and by the potential of enlightened government funding of the arts. I realized it was possible to make exciting things happen. And so, to my own surprise, I switched directions and accepted a position at the New York State Council on the Arts. From that vantage point, during the ensuing years, I had the great good fortune to see a show most nights of the week and to work closely with hundreds of theatres around the state. Years later I moved to Washington, D.C. to head the Theatre & Musical Theatre programs at the National Endowment for the Arts. Over the subsequent 11 years, I gained tremendous respect for the talent, commitment and contributions of people working in the field around the country. Though the 70s and 80s were a time of heady optimism, in the 90s the NEA and the arts fields ran headlong into the “culture wars.” Opposition to government funding of the arts proved a convenient vehicle for the agenda of a certain segment of Congressional leaders. Eventually the agency’s very existence was placed in serious jeopardy. Ultimately, through the efforts of community leaders and Board members around the country, as well as some stalwart Congressional supporters (including Kansas’s Nancy Kassebaum), the NEA was saved - albeit amidst a significant loss of funds and damaging structural changes. The years that followed were ones of reinvention with a particular focus on embedding theatres more deeply in their communities by diversifying their reach and enhancing their value to their communities. After the NEA I returned to New York to serve as Interim Executive Director of Theatre Communications Group, the national service organization for the not-for-profit theatre. TCG’s services include grant making, advocacy, research, data collection, education, convenings and international programs, as well as publication of "American Theatre Magazine" and service as the field’s largest book publisher. Over the last decade I’ve embarked on yet another chapter - again an unanticipated one - working as a program consultant with a focus on new work,and as a professor. I teach in the Columbia University School of the Arts’ Theatre Management & Producing Program. The Program’s emphasis is on students interested in crossing aesthetic, sector or global borders. My particular focus is on current issues in the field within the context of artistic and societal transformation. SOTA: How did your degree from KU prepare you for your career? Bolt: In so many ways! Within the Theatre department, the level of professionalism and caliber of my fellow students gave me a solid skills-based foundation. I had brilliant teachers who led and inspired. 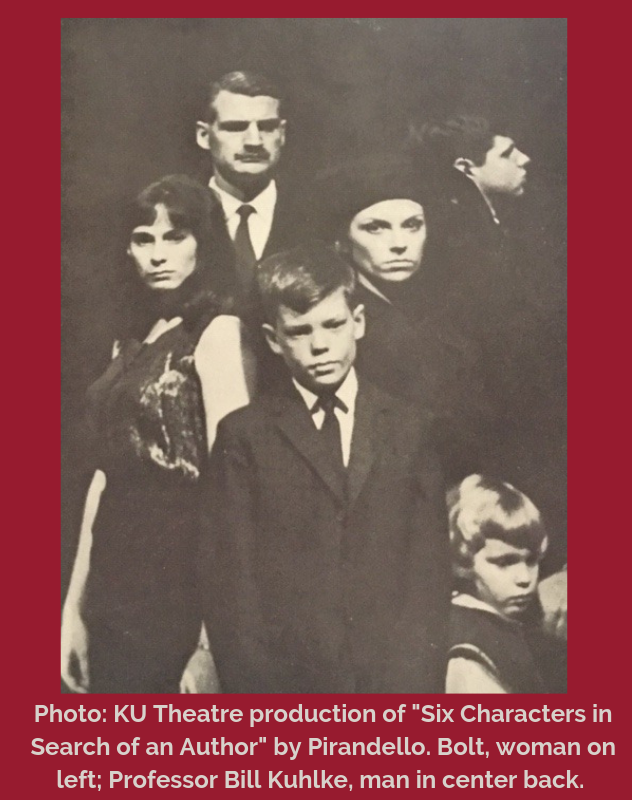 I think of theatre professors Lewin Goff, Bill Kuhlke, Bill Reardon, Jack Brooking and Jed Davis among others, along with professors from other fields including Ed Ruhe and Francis Heller. 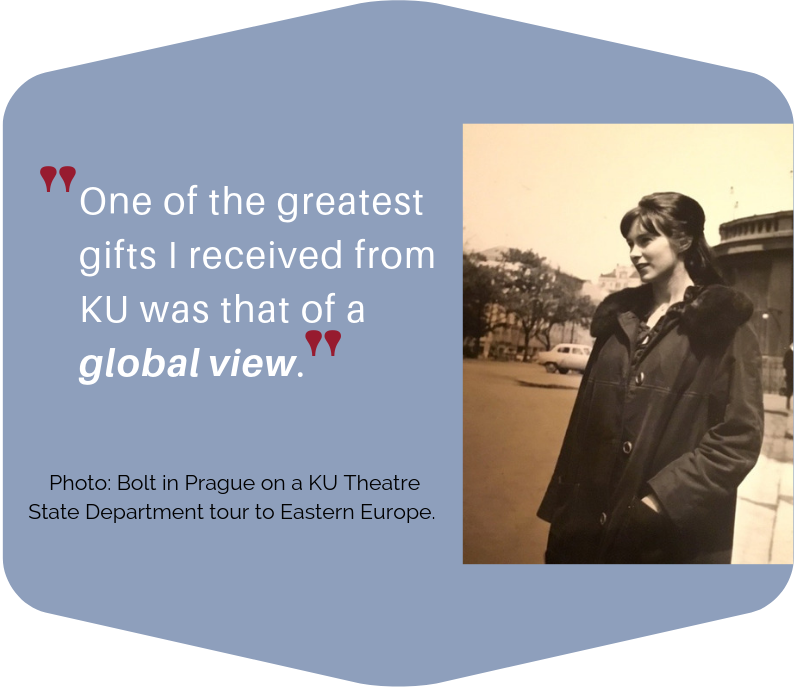 One of the greatest gifts I received from KU was that of a global view. Through university programs and initiatives I spent time each of my four years studying or performing abroad. I studied French at the Sorbonne, German at the University of Vienna, was part of a KU/USO tour of Eastern Asia, and through a KU/State Department tour, studied at the national theatre academies of Poland, Czechoslovakia and Yugoslavia. In Czechoslovakia, our tour preceded “Prague Spring” by a couple of years. Experiencing the central role of artists to the national life during that tumultuous time transformed my view of the possibilities of theatre. It was the 60s. I remain grateful for the freedom and opportunities I was given to engage with diverse groups, people and ideas on campus and abroad. I loved my KU years. SOTA: What advice do you have for current creative and performing arts students at KU? Bolt: The world around us is changing more rapidly than we can grasp. And the nature of a career in the arts is changing commensurately. Your work a few decades hence may bear little resemblance to the theatre or arts career you envision as a student today. It’s likely that most people working in the arts in future years will be what has been termed “hybrid artists,” describing artistic work in a variety of contexts - especially the evolving area of civic practice. However your future work may evolve, a few basic precepts will serve you well. As others have counseled, follow your passion! Do what you love and your days will be meaningful and rewarding. Second, engage deeply. Learn all you can, and say yes to opportunities that extend beyond your current job and primary interest. Each experience will extend your boundaries, expertise and vision. Third, build relationships day by day and year by year with mentors and colleagues. Those people will be instrumental in your career and life in the years ahead. And as they will have helped you, be sure to return the favor to others. Finally, take good care of yourself, embrace the journey, and remember to have fun! SOTA: Do you have a favorite KU memory?